Intensive treatment to prepare hair for optimal colour results from Proclère. Proclère Professional Ice Lites Pre Colour Primer is a spray that primes and preps hair before all colour and bleach applications. It improves condition, shine, locks in moisture and provides radiant, long lasting colour vibrancy. It allows colour pigments to absorb evenly to each hair strand—it does this by evening out the porosity of the hair's structure. Made with ingredients that include an amino acid complex that occurs naturally in hair, it can help nourish and protect your clients' hair for shiny, flawless colour results every time. Dust-free powder bleach with a built-in silverising toner that delivers ice-cold, ultra-pale blonde results every time. Comes in 50-gram sachets or a 400-gram box. A complete treatment for the expert removal of artificial hair colour, leaving hair natural and ready for re-colouring. This set contains enough solution for 2 applications. Oil-infused gel lightener treatment with silverising toner that's designed to give high lift, true blonde results while keeping hair in excellent condition. 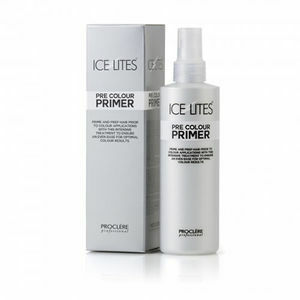 Contains 1 x 50-ml bottle of Freeze Ice Lites Gel Lightener and 2 x 26g Freeze Ice Lites Accelerator.